I haven't written about anything wedding-related in a while, and this isn't a wedding blog. But this is where I write about stuff, and something *REALLY* cool happened to me, so I want to share it. One of the few wedding blogs I still subscribe to is A Practical Wedding. Meg is the kind of girl who I would love to be friends with in real life. She just... gets it. Oh and she featured our wedding last year, which was very flattering. 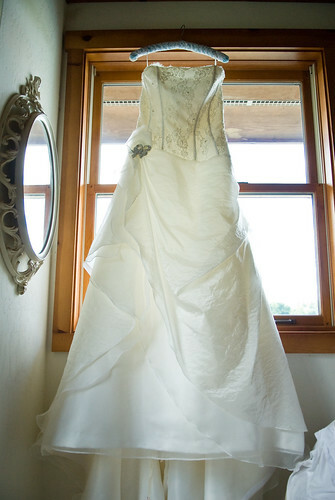 Recently, she posted that one of her readers wanted to give a dress away on A Practical Wedding. I had been planning on donating mine soon anyways, and I was really inspired by the gesture, so I emailed Meg to see if she'd be interested in giving mine away to a reader as well, and she was. The giveaway was posted last week, and the recipient I chose, Chris, was announced yesterday. Her response really spoke to both Meg and me and she seemed like an all-around cool gal. Ok, are you ready for the amazing part of this story? After Meg connected us via email, Chris sent me a sweet note thanking me and included her address for shipping. I almost fell over because she lives a few miles away from me! What are the chances of that? She came over to pick up the dress today, and we wound up chatting for hours. I'm so thrilled that my dress found a happy new home. Awww! Thanks again...I adore the dress! Blog links coming soon!